“My Paper Trail” is an original idea of Ben Adam from march 2010, and is the intellectual property of ALL MAN CORP. This idea can be used with any dating website, or any social networking website such as Facebook or LinkedIn. Having a “paper trail” is optional, a member who skips it still has all the same access to the site. Much like we post our photos in order to let other members know more about us, one’s “paper trail” is designed to take this self-promotion one step further. 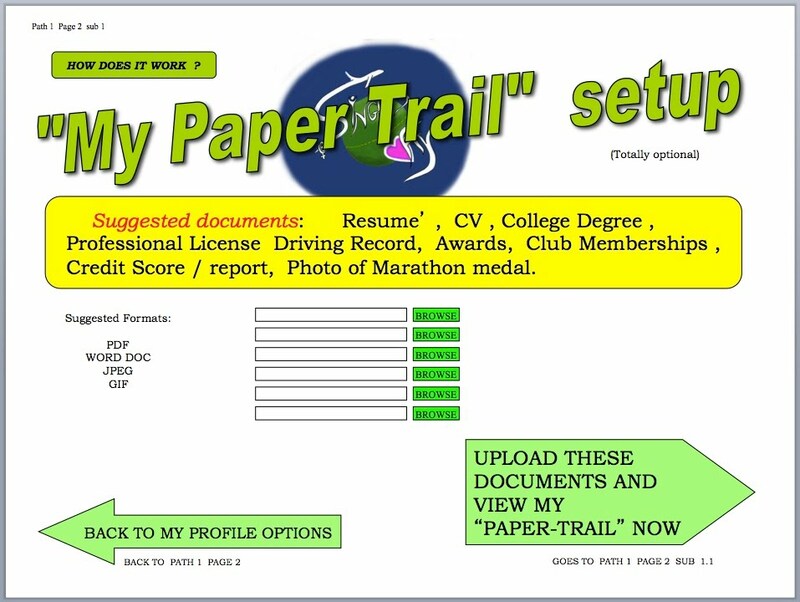 Instead of listing one’s credentials, as one does on a resume’ or on a “LinkedIn” profile, on SinglesFly, one gets a chance to SHOW the actual documents as color scans on their “paper trail” page on their profile. After posting the different documents, one will have to check the boxes permitting visibility of the docs before they will become visible. A member gets to choose who to allow viewing of each document, by either , checking the “allow” box, or simply, “sharing” the particular document with a member of their choosing. SinglesFly allows a member to (try and) share a “paper-trail” document with a member of their choosing, even BEFORE that member accepted their first “hit” or “click”. On the top left of the page there is a link to a tutorial, explaining how to use “my paper trail”. On this page, the user can download up to 30 different documents, proving his/her professional and financial standing in business. Also showing his/her contributions to society and charity. The middle box will give the users a list of suggested documents which he / she might post, in order to give a potential mate, some idea of the user’s business and professional achievements, accomplishments and financial position.